Have you ever wondered how planets are formed? For hundreds of years astronomers have imagined how it could have formed and formed theories around these ideas as more and more evidence came into the picture. 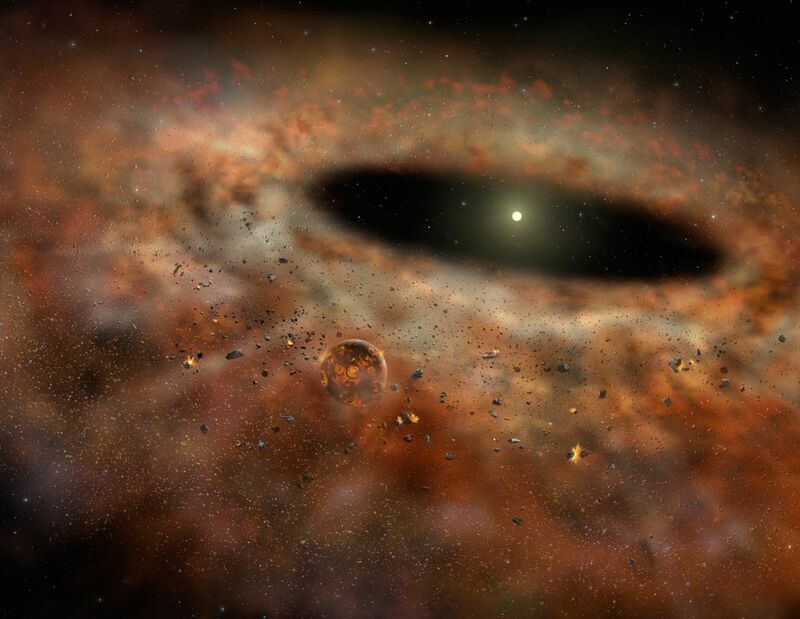 However, we can only observe after the fact planets have formed so it makes it a little difficult to study. There are ways around this and the Hubble Space Telescope has helped scientists all over uncover the mystery of how planets are formed. Let’s take a look. From our understanding we know that a star and its planets form out of a collapsing cloud of gas and dust within a larger cloud, which is called a nebula. Some of these gasses and dust are leftovers from supernovas and colliding stars. As gravity starts to take over and pulls in the materials together, the cloud compresses, churns, and gets hotter. What you would see is a hot core or the birth of a star. The fun isn’t over yet. The cloud around the star starts to churn as the inherent motion within kicks in. The ring of dust and gas gets exceedingly more compressed and starts to rotate all in the same direction. Soon it gets thinner and flatter as it spins more and more, like spinning cosmic pizza dough. The stellar disk or “protoplanetary disks” as astronomers call them, is where the magic happens and planets are born. As everything is moving in the same direction you have a scene of a cosmic shooting gallery. In this shooting gallery, dust or rocks collide together and form into larger rocks. You can think of this when you see dust bunnies form on the ground, as they swirl around and clump together to make larger dust balls. As these rocks swirl around the protoplanetary disk it catches some of the gasses flying around and get bigger and bigger. Soon they start forming more into the familiar shape of a planet or the beginnings of a “planetesimals.” In the inner disk most of the gas has either been gobbled up by the star or cleared out already. 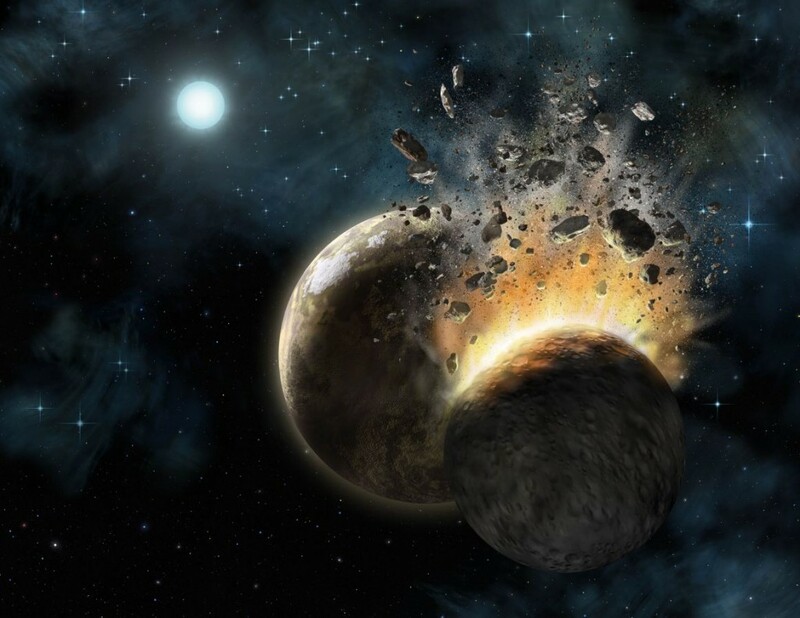 This leads to the formation of smaller rocky planets closer to the star. In the outer area of the disk there is still ice, dust, and gasses looming around. This additional material allows the planetesimals farther from the star to grow larger as it accumulates dust, gas, and ice. Eventually, the path for each planet starts to clear out and be able to travel around the star. The really cool picture that you should visualize now is that hundreds of these planetesimals are forming at the same time. It also means that they inevitably meet up and collide. If their paths cross at the right time and they’re moving fast enough – CRASH – right into each other sending debris every which way. However, if they are travelling slowly and moving toward each other then gravity can gently mend the two together. If the two pieces of rock or participants are further away, their gravitational encounter can pull the body off the course. This means trouble as it can send these participants flying across lanes of traffic and causing multiple collisions. So you can imagine how active the process is and extremely dangerous for anyone within it. After millions of years of countless encounters and collisions the dust starts to settle and you are left with many larger and fewer planets that dominate their area. I believe the Bible version of how planets were formed to quote; “In the beginning God created the heaven and the EARTH.” So when did God create the Earth? To survive 13. 72 billion years Earth had to be a mini star and around the nine billion year mark cool down slightly to dirty-up like Jupiter today to produce a crust. This took about four and a half billion years. The history of the planets thermals has been constant for that time in its solid structure in the mantle. The creation of new atoms to make matter has proved to be at a constant temperature at just 6000 c which is the same as our Sun. The Earth’s primary source of heat is nuclear fusion and not from liquid or solid iron cores for the gravity is too high by mass to come from an iron source. What lay under the nuclear fusion, the fuel for its perpetuation is extremely cold, positively charged and has a magnetic polarity. The proposed double hot and hotter iron cores simply could not produce the thermal variants for the planets ice caps. On the other hand the primary source that feeds the nuclear fusion does. Then there are the complexities involved with interactive forces between bodies of mass. Stabilization of orbits are two loosely explained by centrifugal force and gravity. Using my model with a primary of nuclear fusion the interactive forces are much more stable and containing factors of repelling to other bodies of mass and factors of attraction to the solid matter produced. I found this to be the case with the whole Galaxy from the host star in the middle to beyond the perimeters of its body.